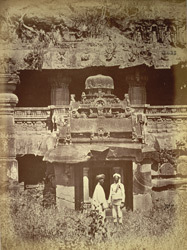 Photograph of the entrance to the Indra Sabha rock-cut temple at Ellora, taken by Henry Mack Nepean in 1868, from the Archaeological Survey of India Collections. The spectacular site of Ellora is renowned for its series of Hindu, Buddhist and Jain cave temples excavated into the rocky façade of a cliff of basalt. The work was carried out under the patronage of the Kalachuri, the Chalukya and the Rashtrakuta dynasties between the 6th and 9th centuries. Indra Sabha is the largest cave of the Jain series and was excavated in the 9th century under Rashtrakuta patronage. A simple gateway leads to a courtyard in which there is a monolithic shrine with a pyramidal roof. The cave has a double-storey and is excavated in the rear of the courtyard. The lower level is unfinished while the columned hall of the upper floor has three niches and a sanctuary. The columns have elaborate foliate and garland motifs carved on their shafts and sculptured panels on the walls depict the Jain tirthankaras or saviours.